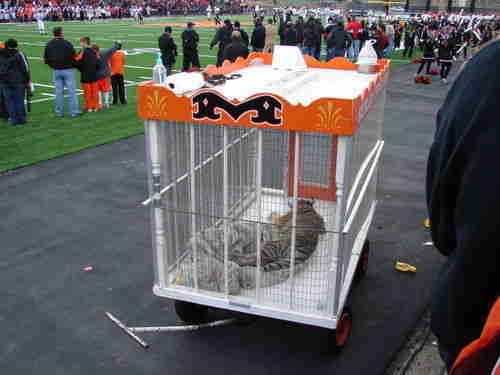 For 45 years, Massillon Washington High School has been parading baby tigers onto its field during football games, replacing each animal as soon as they grow too big. Lilly was one of those tigers. Like the mascots who came before and after her, she was born at a breeding facility and taken away from her mother as a cub - only to be be traumatized, again and again, by the screaming crowds at this Ohio school. Between games she lived in a tiny cage at the school with no company aside from her brief, terrifying appearances in front of that deafening crowd. 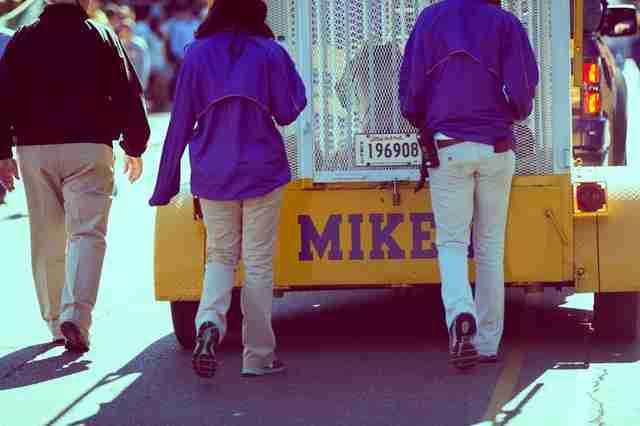 Of course, Lilly isn't the only live animal known to be dragged in front of a crowd for sporting events. It's a long-standing tradition among many U.S. schools - one that, sadly, continues today with a virtual traveling zoo of mascots from lions to bears to buffalos. Most of these animals are torn from their mothers as babies, hauled into the bright lights (mostly in tiny cages) and, when they outgrow those cages, dumped. Most face anonymous endings at the same breeding facilities where they were born. Others find even more tragic endings. Lilly is a special case. She's one of the few live mascots who has been tracked by animal rescuers since she was young - from the facility that raised her to the high school that exploited her and back to a breeding facility again. While many used-up mascots disappear after a short career in the spotlight, Lilly has left enough of a trail for Tammy Thies, founder of Wildcat Sanctuary in Sandstone, Minnesota, to follow. "She's probably the first animal we've followed since she was 6 months old," Thies tells The Dodo. "Just about her entire life." Her story reads like the bleakest biography. "We don't know when Lilly was born or where," Thies said. 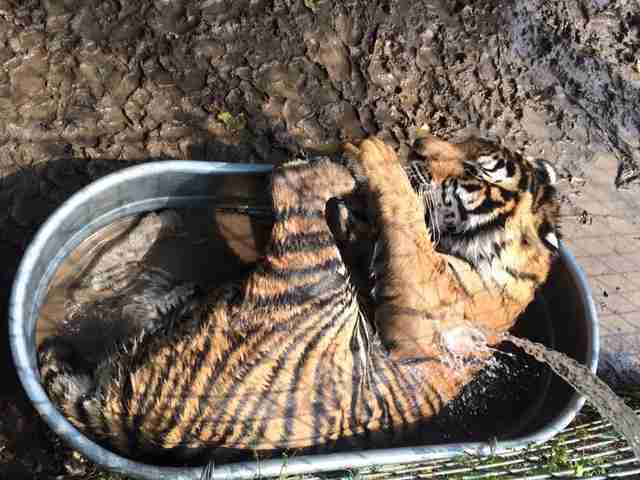 "All we know is that she was less than a year old, an obvious tiger cub, when we were first contacted that she was to be used as one of the Obie cubs by Massillon's high school." After the 2015-2016 football season ended, Lilly went back to Stump Hill Farm, the nearby facility that had lent her to the school. There she spent day after day in a tiny cage, flanked by an adult lion on one side and an adult tiger on the other side. Stump Hill Farm, which is located in Ohio, bills itself as "an exotic animal rescue." But Thies sees it as more breeding facility than rescue. Stump Hill has a long history of welfare violations - it was cited by the U.S. Department of Agriculture (USDA) in 2013 for numerous violations. Some of those violations include allowing a reindeer to fall onto a highway, cages filled with feces and denying adequate medical care to an injured wolf and lion. A year later, the facility downsized its operation and shipped out several animals. For a nerve-racking period, Thies lost track of Lilly. She had disappeared. For Thies it was heartbreaking, especially after spending so long watching Lilly get bounced around, handed down, enthroned for football season, dethroned and locked away. Like a worried guardian anxious to read reports on a child bouncing around from institute to institute, Thies was constantly scanning social media for news and watching undercover videos about Lilly. But months later, the young tiger surfaced - this time at a facility in Michigan called Summer Wind Farms. Thies didn't see Summer Wind Farms as much of an upgrade for Lilly. Neither, it seemed, did the USDA, which filed a 24-page complaint against the site, citing Animal Welfare Act violations from 2012 to 2015. It was eerily reminiscent of the USDA citations against Lilly's old home, Stump Hill Farms. 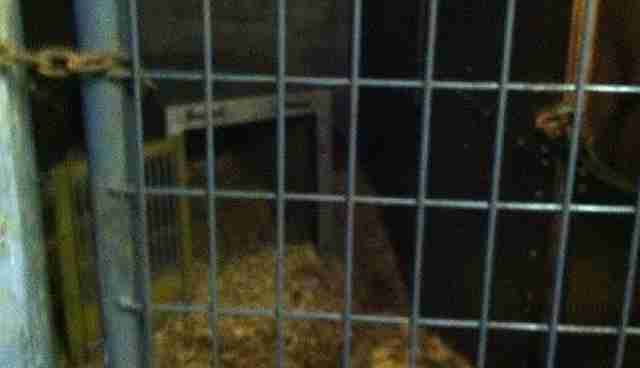 The animals were found living in decrepit cages, mired in their own feces and lacking veterinary care and clean water. The USDA investigation is ongoing - both facilities have denied the allegations. And so is Lilly's uncertain life. "They'll probably try to hold onto their animals as long as they can and maybe at some point, when there's enough pressure, they might start rehoming them to their friends or other like-minded organizations," Thies explains. Thies just wants Lilly to come home - the home she was always meant to have. "We will always offer Lilly a permanent home," she said. "No matter where she ends up years from now. We will never be too full to take Lilly in." But even Thies admits the possibility is tragically remote. "What she embodies is kind of the whole captive wildlife cycle," she says. 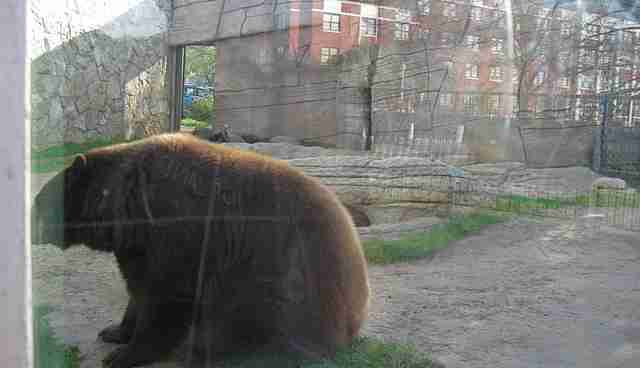 "Rarely do these big cats that are born in captivity live out their lives where they are born. They get traded and passed around. That's really what has happened to Lilly." But Thies is keeping hope alive that one day, this former football mascot will finally find refuge. We should all be cheering for this tiger. You can join the fight to give Lilly a true sanctuary by making a donation to the Wildcat Sanctuary. 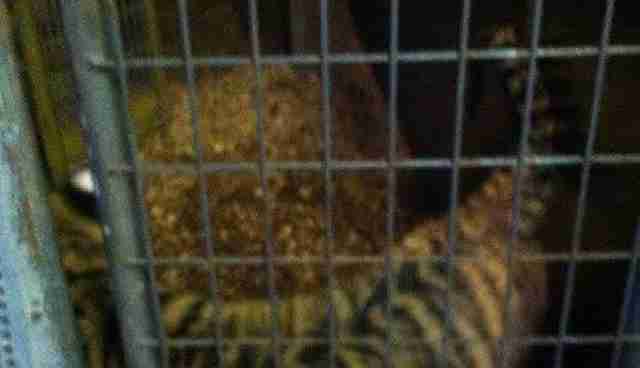 And consider signing this petition calling for an end to Massillon Washington High School's annual lease of live tiger mascots.